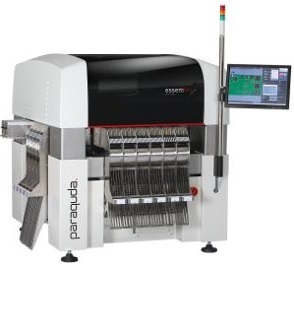 The Paraquda defines a new standard of highly flexible SMD pick & place machines. Drive technology, materials, vision system and software have been developed especially for this machine and are trend-setting. The Paraquda combines four machines in one: A chip placer, a fine pitch placer, an odd-shape component placer and a dispensing machine. FLX feeders can be re-used on Paraquda.